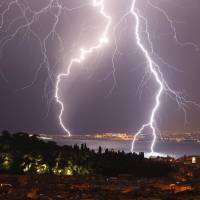 NEW YORK - Researchers have identified lightning bolts in Oklahoma and France as the longest on record and warn that their discovery could alter traditional thinking of when it is safe to go outside after a storm passes. 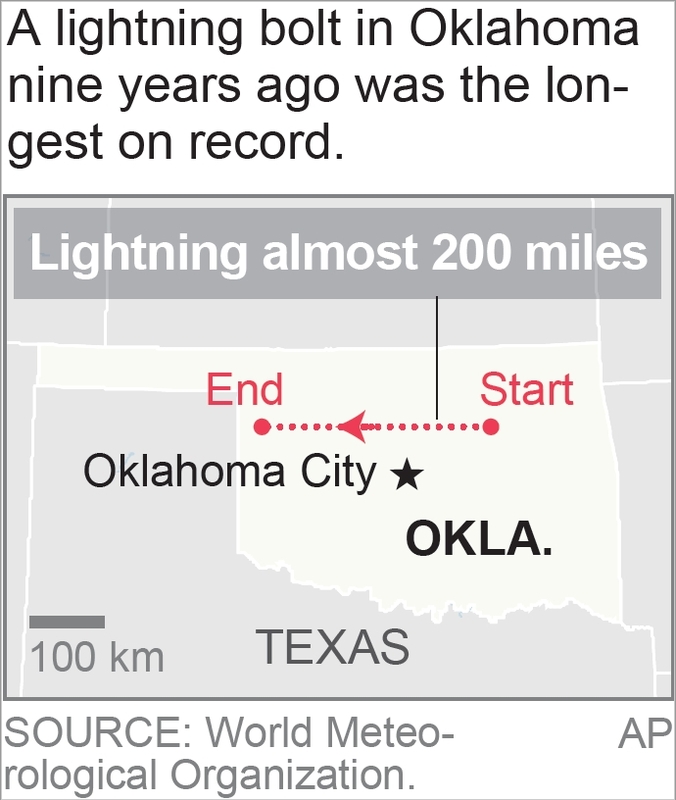 A 2007 storm in Oklahoma produced a lightning bolt nearly 200 miles (320 km) long. 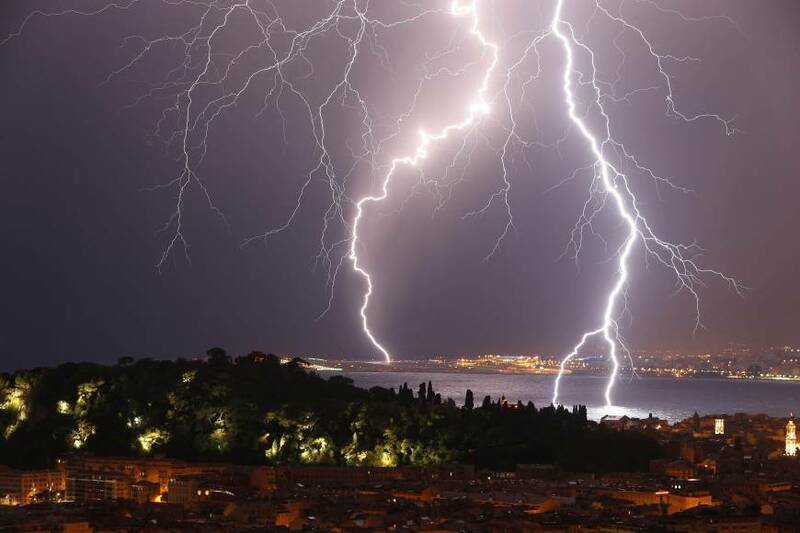 A 2012 storm in southern France produced a single flash that lasted 7.74 seconds. Both events were added Wednesday to a list of weather extremes kept by the World Meteorological Organization. 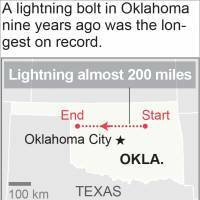 Timothy Lang, a researcher at NASA’s Marshall Space Flight Center in Huntsville, Alabama, said the record Oklahoma lightning bolt streaked from Tulsa, near the Arkansas border, to near the Oklahoma Panhandle. The bolt started at an altitude of 6 miles (9.6 km) and reached the ground in a number of places, he said. A researcher in Colorado saw the streak, and Lang said its length could change thinking about safety after a storm. Meteorologists generally suggest a “30-30” rule when storms are near. Start counting when you see a lightning bolt. If you reach 30 seconds before hearing the thunder, it is generally safe to continue outdoor activities. If thunder is heard in under 30 seconds, stop outdoor activities and wait 30 minutes before resuming. Cerveny said not all storms will have lightning as extreme as the Oklahoma and French storms. The Oklahoma storm was in a particularly large complex of bad weather that occurred very early on June 20, 2007. Lightning sensors on the ground tracked the bolt’s path. The Oklahoma flash lasted a bit more than five seconds, while the French bolt doubled back on itself, extending its life to 7.74 seconds, said Cerveny, a professor of geographic sciences at Arizona State University.